The process of moving from one home to another is always stressful, but perhaps the worst part of the job is packing everything you own. It takes a lot of time and effort to make sure you have everything you need and nothing is left behind. You also have to worry about the fragile items and whether or not they were stored properly for the move. It’s a process that’s really draining emotionally, physically, and mentally. To make sure you don’t miss anything, it’s a good idea to make a checklist. In fact, make a checklist for every single room. The list can include the items you will keep, the ones you can sell or donate, and the ones that can go to the garbage. Before you start packing, make sure you have the right tools and supplies. Packaging tape plus cardboard boxes and box cutters – these are the tools you need. 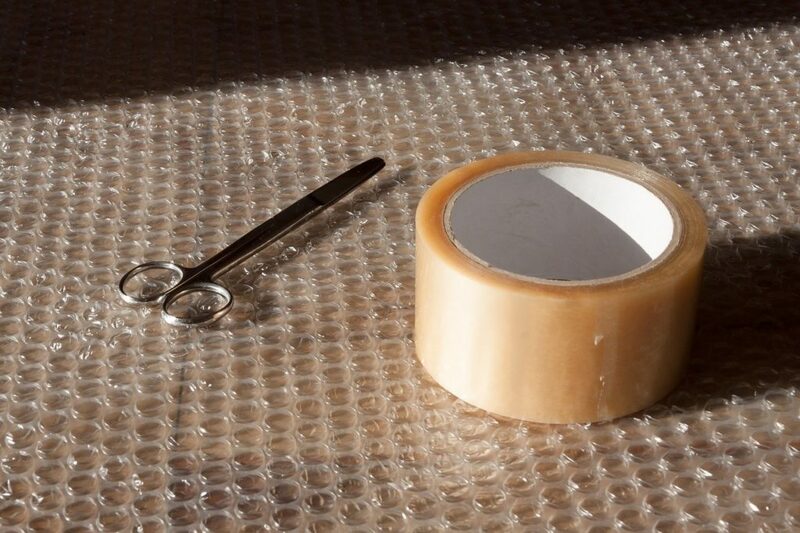 Make sure you don’t forget about the bubble wrap and other packing tools for fragile items. Ask your local grocery stores if they have boxes that you could have for free for moving. In our city the local liquor stores are happy to let us take as many boxes as we want. 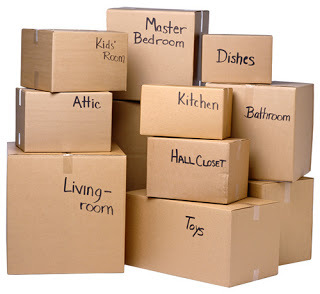 As well, if you are hiring a moving company many times they will have a deal where you can rent moving boxes from them (brand new or used) and then return them after you have finished unpacking. We did this for our last move and it saved us a lot of money and a lot of time. Organize your items based on what they are, and what room they will be unpacked in after your move. You can’t stuff a mop in with your clothes, right? Keep the things in your home in the right boxes so you don’t end up with a mess on your hands. Provide special care for fragile items when you pack them, so that they remain in one piece. Use packing peanuts, bubble wrap, and newspapers to make sure your fragile items are safe from any harm. Find a waterproof container for books and important personal documents so they’re safe and dry. You don’t want to have to deal with water damage in case some accident happens along the way. As well, if you move on a rainy or snowy day and the box is left outside for a bit the plastic waterproof container will protect your valuable documents. Separate your dangerous or hazardous materials. Keep your cleaning materials and other potentially dangerous items in a separate box. If you have any home fire extinguishers or BBQ propane tanks, make sure to transport those in your own vehicle. If you are moving long distance, it is better to dispose of those items at the local Firefighters Hall, and buy new ones at your new location. Have a “first night” box prepared. You won’t finish unpacking in a day, and it’s going to be a chore to hunt through all your boxes to find your plates, glasses and toiletries. Prepare a box of essentials that will contain all the items you might need on your first night in your new home. Prepare a bag of clothes for your first couple of days. Have an overnight bag ready, too, to make sure you have clothes for your first couple of days. You don’t have to stash a lot. Just clothes for a couple of days should be enough while you’re working on unpacking. Check insurance coverage for moving. The moving company usually has its own insurance policies. Clarify this with them ahead of time, and decide if you need to purchase more coverage or not. Never pack wet or even damp clothes, towels or sheets. If you really need to do laundry just prior to your move make sure that everything is dried thoroughly and ready to be packed. Be mindful of the weight per box. Don’t stuff too much into one box. It’s going to be difficult to carry and a chore to handle. You might even strain your back. When filling boxes, check how heavy they are before you close them up, especially when you pack your books. That way if they are too heavy, you can move things to a new box. Label the boxes. Mark the boxes clearly so you know what the contents are. This makes it a lot easier to unpack. Plus, if you have fragile content, write FRAGILE with big bold letters. Mark the destination room for each box. Apart from labeling the boxes for their contents, write down the room they belong in. Put heavy items at the bottom of the box. This isn’t exactly new, but you’ll be shocked by how many people keep throwing items into a box without considering the best way to pack. Always put the heavier items down first then the lighter ones on top. Always keep important documents with you. Don’t pack your documents like passports and deeds into the boxes. Keep them in a folder and in a shoulder bag that you will take with you when you drive to your new home. Don’t use newspaper without tissue first. Newspapers might transfer ink, so wrap your items like dishes and glasses in tissue first before wrapping with newspapers. Sell what you don’t need. If you need to get rid of the things you no longer want, hold a garage sale before you move. It makes packing easier and it makes moving less expensive because you are not paying to move stuff you no longer use. Don’t procrastinate. 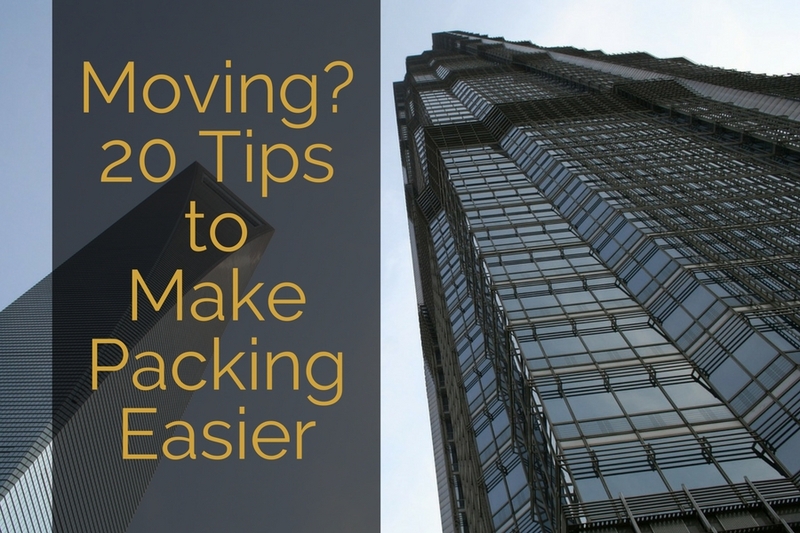 Get going and make sure to do some packing each day before you move. Do any difficult stuff first and always remember all of your closets and storage areas. Do you have a garage or a shed? Make sure to allocate time to pack the items in those areas properly. Many years ago when I was moving across country I thought I had packed everything but as we were doing our last minute checks and heading to the front door of our townhouse I discovered that I had completely forgotten to pack our winter coats and boots in our front hall closet. Oooopppss. Lesson learned! If you are doing the move yourself then use suitcases for clothes. Another suggestion, if you are using a moving company, is to ask them if you can borrow wardrobe boxes to pack all of your clothes into. These are the coolest things on the planet. Ask for at least 2 per person. They make packing and unpacking your closet so quick and easy. 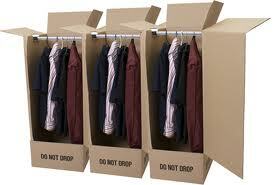 Put shoes in the bottom of the box and hang the rest of your clothes on the rods provided with the wardrobe boxes. Keep valuables in a safe place. Just as with the documents, you want to keep your valuables with you at all times during the move. Just the thought of moving makes some people cry. I guess it depends on how much stuff you have accumulated over the years. My least favorite room to pack is the kitchen.